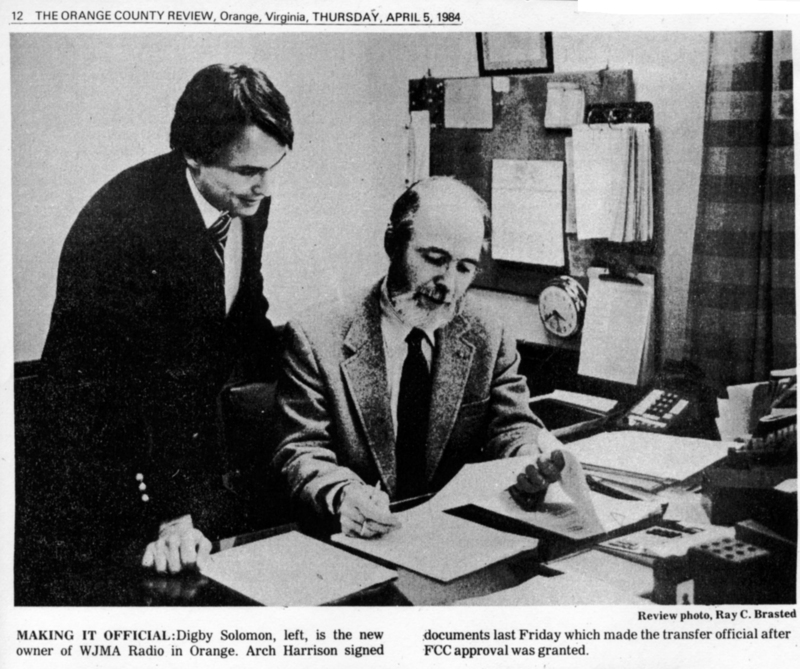 This web site is dedicated to preserving the history of WJMA radio Orange, Virginia. WJMA AM existed from 1949 to 2004 when its call letters changed to WVCV AM. WJMA-FM in Orange existed from November 1971 to October 2004 when the license was transferred to Midlothian, Virginia. The WJMA FM call letters were moved to the former WCUL FM in Culpeper and the FCC license was also moved to Culpeper. This site contains pictures and audio from the time WJMA AM/FM was licensed to the Town of Orange, Virginia. Although WJMA was licensed to Orange, it had a wide audience outside of Orange County, especially after WJMA FM went on the air. 5/8/2013 added photos of "Guitar Contest of the Century"
8/18/2013 added Chapter 3 of the WJMA Documentary to YouTube. 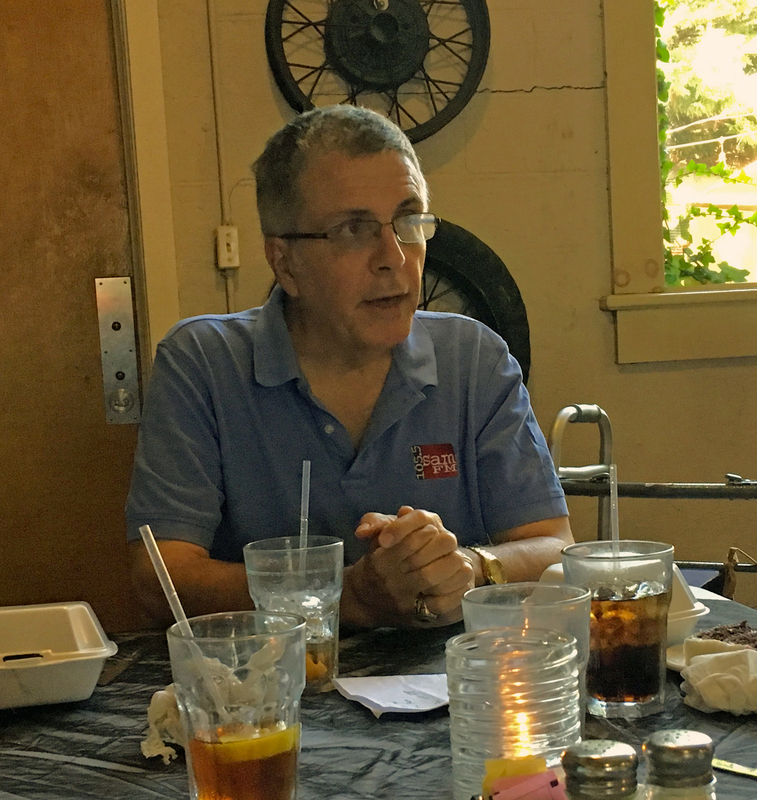 Phil Goodwin retired from Piedmont Communications, owner of WJMA, in the summer of 2018. On August 23, the station held a retirement luncheon for Phil. He joined WJMA in July 1976. Over the years he held did about every job the station had to offer. Since 1993 he's been the News Director and over the years he's racked up an impressive number of awards including a Radio/Television News Directors Edward R. Murrow Award and the 2017 Virginia Assocation of Broadcasters George Bowles Distinguished Performance in Broadcast News Award. WJMA AM (1340 kHz) began broadcasting at noon on September 10, 1949 with 250 watts of power full time. WJMA was named for the James Madison, the father of the US Constitution and fourth President of the United States was a resident of Orange County, Virginia. The first WJMA studios were located in the DeVivi Restaurant on the south side of the Town of Orange. The tower was behind the building. One of the original owners of WJMA was Welford Sherman. The James Madison Broadcasting Corporation sold the license to Woodbury Ober in 1957. In 1959 Charlottesville Broadcasting, owners of WINA AM in Charlottesville, merged the operation of WINA and WJMA. In early 1960 WJMA moved to a new building on Spicers Mill Road on the north side of the Town of Orange. The tower was located behind the building. The location was chosen in part because the land behind the building was swampy and well suited to AM radio transmission. Daytime power was increased to 1000 watts. Arch Harrison and WJMA Incorporated purchased the license from Charlottesville Broadcasting on July 1, 1961. WJMA FM (96.7 mHz) went on the air November 25, 1971 as a simulcast of WJMA AM. WJMA began using the slogan "Radio Orange" in the late 1970s. In the early 1980s WJMA AM increased nighttime power to 1000 watts. Some consider the 1975-1983 period the "golden years" for WJMA which sometimes considered itself a rural version of WMAL AM, Washington, DC. WJMA had a strong local news and sports commitment. The music was Middle of the Road (MOR) which evolved into Adult Contemporary (AC) by the late 70s. In 1978 the news staff won 7 of 8 Associated Press news awards for non-metro radio stations. Between 1973 and 1984, WJMA won 18 Associated Press awards. WJMA had many sports newscasts each day as well as a full schedule of local, college and professional play-by-play. There's more information on the sports page. Digby Solomon and Solomon & Lowe purchased WJMA AM/FM on April 1,1984. In December of 1984, WJMA FM changed to WVJZ FM, (Z96.7), playing Adult Contemporary music while continuing to simulcast with WJMA AM. Solomon & Lowe sold to Carl Hurlbaus and Capitol Radio Holdings in 1988. The news and sports coverage was reduced and the music took on a more Top 40 flavor with the slogan "Jamin' 96". After a period of decline, the stations were purchased by a group of local business owners under the name Piedmont Communications on January 1, 1993. The format was changed to country music with the slogan "Country Mix 96" and the FM call was changed back to WJMA FM in February of 1990. In June, 2001 a three station shuffle to allow WSIG FM in Mount Jackson, VA, and WREL FM in Lexington, VA, to increase power, WJMA FM moved to 98.9 with a new slogan of "Your Place In The Country". WJMA AM changed call letters WVCV AM and featured satellite provided oldies and talk programming. In the fall of 2002, Piedmont Communications traded the 98.9 frequency to North Carolina station owner Tom Joyner for Joyner's two Culpeper, Virginia stations: WCVA AM (1490 kHz) and WCUL FM (103.1 mHz). At approximately the same time, Piedmont Communications purchased WLSA FM (105.5) in Louisa, VA. On March 1, 2004 the WJMA FM programming was added to the WCUL FM tower transmitting from Clark Mountain on the WCUL frequency of 103.1. At midnight on April 15, 2004 WJMA FM at 98.9 was turned off thus ending almost 33 years of an FM station licensed to Orange. While the studios remain in Orange the city of license for WJMA is now Culpeper. The WJMA AM call letters were abandoned when the AM station became WVCV. WVCV plays “standards” from a satellite delivered programming service. WVCV is simulcast with WCVA (1490 kHz) in Culpeper. WCVA is also a Class 4 AM station. Please explore this site to see what we've collected. You many leave comments in the guest book or write to the webmaster. Likewise if you have pictures, audio, or memories to contribute, please contact the webmaster. There is a companion email list for WJMA Alumni and friends. Click this link to go to the Group home page. WJMA weather for Orange and vicinity..